I found this recipe at Abounding Treasures. Hope you enjoy it! 2 Bake at 350 degrees for 25 minutes until bubbly. 3 Serve with thinly sliced baguette or rye bread. Makes a great dip for either thinly sliced baguette or rye breador your favourite crackers! Preheat oven to 400 degrees. In a medium saucepan, melt butter. Add water, bring to a boil. Add flour and salt all at once; stir vigorously. Cook and stir until mixture forms a ball that doesn't separate. Remove from heat; cool slightly, about 5 minutes. Add eggs, one at a time, beating with a wooden spoon after each addition (1 to 2 minutes, or until smooth). Drop batter by heaping tablespoons, 3 inches apart, onto a greased baking sheet. Bake in a 400 degree oven for about 30 minutes or until golden brown and puffy. Remove from oven; split, removing any soft dough inside. Cool on a wire rack. Fill with whipped cream, pudding, ice cream, or fruit mixture. Let cream cheese come to room temperature. Mix cream cheese and picante sauce with a wire whisk until blended. It may be a little chunky. Cool and serve with tortilla chips. Cream butter, cream cheese and sugar until light and fluffy. Add salt and vanilla. Add eggs one at a time and beat after each addition. Add flour, dividing into four additions. Pour into 10" round tube cake pan. Grease only the bottom of the pan for a smooth even cake. Bake at 325 degrees Fahrenheit for 1-1/2 hours or until done. Mix together, chill and serve with potato chips. Place cranberries and tangerine in a food processor; cover and process until coarsely chopped. Set aside. In a small saucepan, bring vinegar and shallots to a boil. Reduce heat; simmer, uncovered, for 5 minutes or until mixture is reduced to 1/3 cup, stirring occasionally. Stir in the sugar, jalapenos, pepper and reserved cranberry mixture. Cook for 5 minutes over medium heat, stirring frequently. Transfer to a small bowl; refrigerate until chilled. Place bread on ungreased baking sheets; lightly spray bread on both sides with cooking spray. Broil 3 to 4 inches from the heat for 1 - 2 min on each side or until lightly browned. 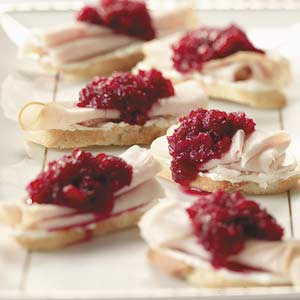 Spread each slice with 1-1/2 teaspoons cream cheese; top with turkey (or chicken) and 1 tablespoon cranberry mixture. Line a 9-inch pie plate with pastry; trim and flute edges. Set aside. In a large bowl, combine the flour, syrup and butter until smooth. Add the pears and cranberries; toss to coat. Spoon into crust. For topping, combine the flour, brown sugar and cinnamon; cut in butter until crumbly. Stir in walnuts. Sprinkle over filling. Cover edges of crust loosely with foil to prevent overbrowning. Bake at 400 degrees for 15 minutes. Reduce heat to 350 degrees. Remove foil; bake 35 - 40 minutes longer or until crust is golden brown and filling is bubbly. Cool on a wire rack. To the juice and rind of 1 orange, add butter or margarine and enough boiling water to equal 3/4 cup of liquid. Let cool. Add dry ingredients. Add slightly beaten egg. Mix well. In a separate bowl, mix cranberries, walnuts, and flour. Add to above batter. Mix well, batter will be lumpy and stiff. Bake at 350 degrees in a greased pan for 1 hour or until pick in center comes out clean. Cook 1 package cornbread mix using water instead of milk. While it is cooking, chop up the celery, bell pepper, tomatoes and green onions. Grate the hard-boiled eggs. Crumble cornbread and mix with vegetables, eggs and mayonnaise. CAKE: Combine flour and sugar. Heat margarine and Coca-Cola to boiling point; pour over flour mixture. Mix well. Add buttermilk, eggs, baking soda, vanilla, cocoa, and marshmellows. Pour into greased cake pan. Bake at 350 degrees for 35 minutes. ICING: Combine butter, Coca-Cola, and cocoa. Heat mixture, pour over powdered sugar. Use more or less powdered sugar as needed. Beat well. Ice cake while cake is still hot. Sprinkle chopped nuts over cake. In large heavy pan,lightly brown beef and onion in oil.Add tomatoes(put through blender or cut with edge of spoon),tomato paste, water,parsley,salt,sugar,garlic powder,pepper and oregano; simmer uncovered, stirring occasionally, about 30 minutes. Meanwhile cook lasagna as directed on package; drain. In 13 x 9-inches baking pan, spread about 1 cup sauce. Then alternate layers of lasagna, sauce, ricotta, mozzarella and Parmesan cheese, ending with sauce, Mozzarella and Parmesan. Bake at 350 degrees F for 40 to 50 minutes until lightly brown and bubbling. Allow to stand for 15 minutes; cut in squares to serve. Makes 8 servings. Mix soup, evaporated milk and water in your crockpot. Heat on low until hot throughout (about 2 - 3 hours). Add Velveeta and frozen broccoli. Heat another 1 - 2 hours until cheese is melted and broccoli is cooked through. Serve hot. This recipe can easily be cut in half. Cook broccoli according to package directions, drain well. Sauté green onions in butter on medium heat. Add mushroom soup, Worcestershire sauce and red pepper, mix well. Cut and add garlic cheese rounds to mixture and cook until melted and blended. Put broccoli in casserole dish and pour sauce mixture over broccoli, mix well. Sprinkle bread crumbs on top. Dot with butter and cook at 375 degrees for 30 minutes. Mix together the eggs, vanilla and 1 1/4 cup of sugar in a medium size mixing bowl until sugar is dissolved. DO NOT WHIP. Add half and half and heavy cream slowly to egg mixture until well blended. Mix sugar, cinnamon powder and raisins in a small bowl. Lay white bread in a 9x13 inch deep baking pan. Sprinkle the cinnamon/sugar/raisins mixture on top. Poor liquid mixture on top, pushing bread down when it begins to float. Soak bread well. Cover pan with foil. Place on a sheet pan filled with water. Bake in a pre-heated 320 degree oven for 1 hour or until pudding is firm on top and no liquid is showing. Take out of oven, remove foil from pan. Let cool and serve. Mix salt, pepper and garlic together thoroughly. Rub on both sides of fish filets. Place in a buttered shallow baking dish. Combine butter, lemon juice and Worcestershire sauce. Bake fish at 375 degrees for 30 minutes or until it flakes easily with a fork. Baste fish with butter mixture every 5 minutes or so during cooking. Pour into a greased 10" tube cake pan and bake for 50 minutes at 350 degrees F.
Cream butter and sugar. Add well beaten egg, vanilla and the rest of the ingredients. Mix. Turn into well buttered pan. Bake slowly in moderate oven, 350 degrees 1 hour. Contributed by Lisa! Thanks, Lisa! In large bowl, combine ingredients. Mix well. Chill. Garnish as desired. Refrigerate leftovers. Pour reserved syrup over rolls. Bake at 350° for 40-45 minutes or until golden brown. Serve warm. Assemble all ingredients and utensils. Toss berries, sugar and flour, place in an ungreased 9-inch baking dish. Sprinkle berries with lemon juice and dot with butter, set aside. In a large bowl mix flour, salt and baking powder. Gently fold cream into flour mixture. Place dough on floured board and knead for 1 minute. Roll dough to 1/2 inch thickness. Cut into lattice strips or place the entire sheet of dough on cobbler. Sprinkle with sugar. Bake in a 400 degree oven for 10 to 12 minutes then reduce heat to 325 degrees and bake another 20 minutes or until golden brown. Cook bacon until crisp, drain and crumble into medium-sized pieces. Combine bacon and next five ingredients in medium bowl. Soften tortillas until pliable in microwave for approx. 10 to 15 seconds. Spread 1/3 of the filling over each tortilla, leaving 1/2 inch border. Roll up tightly, enclosing the filling inside. Wrap in plastic and chill until the filling is firm, at least one hour. Preheat oven to 400 F. Remove plastic and slice off unfilled ends. Cut rolls crosswise on slight diagonal into 3/4 inch thick slices. Arrange on large baking sheet. Bake until heated through about 7 minutes. Makes approximately 30 roll-ups. Chop shrimp into small pieces. Heat large sauté pan and add butter. Once butter is bubbling add the shrimp. Toss and add Blackening seasoning. Add cream cheese that has been softened (microwave for 2 minutes) Stir with a wooden spoon and add soy sauce, crabmeat and green onion. Once the mix has been combined, pour into a casserole dish and cool to create filling. Place wonton squares on a cutting board and paint with egg wash. Scoop a half-ounce of filling into the center of the square wrappers. With four fingers, press in the middle of all four sides of the wrapper square. This creates a wonton flower. Press to create a seal. Cool for an hour, no longer. Drop into deep fat fryer at 350 degrees, and cook for 4 to 5 minutes or until golden brown. Cut a horizontal slit in one side of each chicken breast half to within 1/2 in. of the opposite side. Spread honey mustard inside each pocket; stuff with two ham slices. Place in a greased 13-in. x 9-in. baking dish. Brush with butter; sprinkle with pretzels. Bake, uncovered, at 350° for 40-45 minutes or until chicken juices run clear. Yield: 4 servings. Season the beef generously with salt and pepper. Add oil to kettle. In the cast iron kettle over medium-high heat, brown the beef on all sides (should take approximately 5 minutes). Reduce heat to medium/medium low, add 1 cup beef stock and slow cook beef approximately 1 hour. After meat is tender, (the approximate 1 hour), add the remaining ingredients. Cook over medium heat for 30 to 45 minutes. Remove bay leaf, serve with crackers or corn bread. In a large skillet, cook onion and garlic in oil over medium heat until tender. Stir in chicken and enchilada sauce. Bring to a boil. Reduce heat; simmer, uncovered, for 5 minutes or until slightly thickened. Meanwhile, in a small bowl, combine the eggs, ricotta cheese and cilantro. Spread 3/4 cup chicken mixture into a greased 13-in. x 9-in. baking dish. Layer with three noodles, 2/3 cup ricotta mixture, 3/4 cup chicken mixture and 1 cup shredded cheese. Repeat layers twice. Top with remaining noodles, sauce and shredded cheese. Cover and bake at 375° for 30 minutes. Uncover; bake 10-15 minutes longer or until bubbly. Let stand for 10 minutes before cutting. Yield: 10-12 servings. In a large bowl combine cream cheese, sour cream, jalapeno peppers, salsa, pimento and garlic. Taste mixture and add enough extra jalapeno peppers and/or salsa to achieve degree of heat preferred. Stir in shredded cheese and mix completely. Serve with chips or vegetables. Mix all ingredients in a 2 quart casserole. Bake in a 350 degree oven for 30 to 35 minutes. After 15 minutes, stir ingredients and continue baking. Serve with rye crackers, Frito Scoops or toasted Rye bread. Bake, uncovered, at 375° for 40-45 minutes or until a meat thermometer reads 160° and potatoes are tender. Let pork stand for 5 minutes before slicing. Yield: 3-4 servings with potatoes plus 1 pound leftover pork. Season the sliced tomatoes with salt and pepper to taste and dredge them in the cornmeal. Heat the oil in a skillet over medium-high heat. Fry the tomatoes until golden brown on both sides. Spread the mayonnaise on the bread. Add the lettuce on both sides. Add the fried green tomatoes and bacon. Build a sandwich and cut in half. Saute the onion in the butter in a large skillet over medium heat for 5 minutes. Add the green chilies and saute for 1 minute. Stir in the chicken and cream cheese. Cook until the cream cheese melts, stirring constantly. Arrange tortillas on work surface. Spoon 2 to 3 tablespoons of the chicken mixture down the center of each tortilla. Roll the tortillas to enclose the filling. Arrange seam side down in a lightly greased 9x13 baking dish. Sprinkle with Monterey Jack cheese. Drizzle with cream. Bake at 350 degrees for 30 minutes or until bubbly and light brown. In a large mixing bowl, combine the sugar, oil, pumpkin and eggs. Combine the flour, baking soda, salt, baking powder and cinnamon; add to pumpkin mixture and beat until well mixed. Fill paper-lined muffin cups two-thirds full. Bake at 350° for 18-22 minutes or until a toothpick comes out clean. Cool for 10 minutes before removing from pans to wire racks to cool completely. In a large mixing bowl, cream shortening, butter and confectioners' sugar. Beat in vanilla if desired. Gradually add the cornstarch mixture, beating until light and fluffy. Using a sharp knife, cut a 1-in. circle 1 in. deep in the top of each cupcake. Carefully remove tops and set aside. Spoon or pipe filling into cupcakes. Replace tops. In a large bowl, beat cream cheese until fluffy. Beat the sugar, egg and salt smooth. Fold in chocolate and peanut butter chips; set aside. For cupcakes, in a large bowl, beat the sugar, water, oil, vinegar and vanilla until well blended. In a large bowl, combine the flour, cocoa, baking soda and salt; gradually beat into sugar mixture until blended. Bring a large pot of water seasoned with salt to a rolling boil. Add pasta and cook for approximately 1.5 to 2 minutes. Do not over cook Add jumbo lump crabmeat, lemon juice, salt, pepper and brown butter vinaigrette and toss 30 seconds. Add spinach and toss for 15 seconds. Add ravioli to the pan and toss for moments. Season to taste. Spoon onto plate and finish with cheese. In a Dutch oven, saute the onion, celery and garlic in oil until tender. Add green pepper and olives; saute 2-3 minutes longer. Dissolve bouillon in hot water; add to vegetable mixture. Stir in the tomato sauce, tomatoes, tomato paste, mushrooms, basil, oregano, salt if desired and pepper. Bring to a boil. Reduce heat; cover and simmer for 1 hour, stirring occasionally. Serve over pasta. Yield: 12-14 servings. Contributed by Aunt Janice. This dish took first place at the TN state fair! Preheat oven to 375 degrees F. Allow puff pastry to reach room temperature to be pliable. Unfold puff pastry on floured board or pastry cloth. Cut into 16 to 20 squares. Cut chicken breast into bite size pieces, about 1-inch in size. Mix cream cheese and ranch dressing packet together until well combined. Place a spoonful (2 teaspoons) of the cream cheese mixture on the puff pastry. Place a chicken cube onto the cream cheese mixture and wrap the puff pastry around the chicken and seal. Place the chicken bite seam down onto a cookie sheet with parchment paper. Beat the eggs and brush each bite with a little egg to add color. Bake the Wellingtons for 15 to 20 minutes until puffy and golden brown. Allow them to sit for 5 to 10 minutes and rest. These are appetizer size and can be made ahead of time and frozen for up to 1 month. Can make larger ones by cutting puff pastry and chicken larger and using more of the filling. Prepare cake batter according to package directions; fold in apples. Fill 12 greased or paper-lined jumbo muffin cups three-fourths full. Bake at 350° for 20 minutes or until a toothpick comes out clean. Cool for 10 minutes before removing from pans to wire racks to cool completely. In a saucepan, cook the caramels and milk over low heat until smooth. Spread over cupcakes. Sprinkle with pecans. 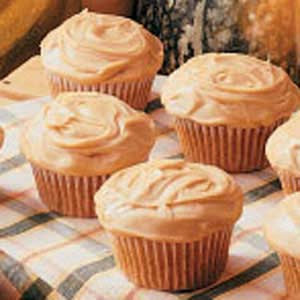 Insert a wooden stick into the center of each cupcake. Yield: 1 dozen. In a mixing bowl, combine first six ingredients, reserving 1.3 cup bacon for garnish. Stir well; season to taste with salt and pepper. Prepare and serve one of two ways (hot or cold) : Preheat oven to 350 F. Transfer ingredients to a lightly greased 2-quart casserole and bake uncovered 25 minutes, or until lightly browned. Serve with crackers or pita crisps. Makes about 3 cups: 24 servings. Mix shortening, sugar, egg and vanilla. Stir in applesauce. Combine dry ingredients and blend into shortening mixture. Stir in raisins and nuts. Drop by spoonfuls onto greased baking sheet. Bake at 375 degrees for 10 to 12 minutes. Note: This is the original cookie recipe dating back to the 1800's in which apples were once used that came from the last known apple tree planted by Johnny Appleseed. For filling, combine sugar, cornstarch and water in a saucepan. Add apples; heat to boiling, stirring constantly. Reduce heat and simmer 5 minutes, stirring occasionally. Stir in spices and lemon juices; set aside. For pastry, combine flour and salt. Combine egg yolks, water and lemon juice; blend into flour. Mixture will form a ball. Divide in half. On a lightly floured surface, roll the dough between two pieces of waxed paper to fit the bottom and halfway up the sides of a 13-in. x 9-in. baking pan. Roll remaining pastry to fit pan exactly; place on top of filling. Fold bottom pastry over top and press to seal. Cut a few small slits in top crust. Bake at 400° for about 40 minutes or until lightly browned. For glaze, combine all ingredients and drizzle over the warm pastry. Contributed by Lisa at A Place to Land! Thanks, Lisa! 3-4 cup water Mix ingredients together - will be thick - I had to use a wooden spoon to stir. Makes: 24 small muffins 1 point each 12 reg. muffins 2 points each. I ended up with 1 and a half dozen good-sized regular muffins, so I counted them as 1.5 points each. They are better the next day - warm they taste spongy, cold they are FUDGY. You will not taste the pumpkin at all. Combine berries in a medium bowl. In small saucepot, stir together remaining ingredients. Cook, stirring constantly, over medium-high heat until mixture comes to a boil. Pour over berries and toss. Serve warm or cold. Makes 6 servings (about 3-1/2 cups). Place all ingredients in large saucepan; stir to combine. Bring to a boil over medium-high heat; continue boiling for 8 to 10 minutes, or until cranberries pop, stirring occasionally. Remove from heat; cool. Store in refrigerator. Makes about 2-1/2 cups. Heat the sugar water and cinnamon just till sugar is melted. Set aside unrolled cresent rolls. 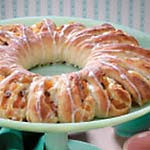 Start at the larger end and put in a slice of apple and roll it up . You should have just 8 slices of apple from each apple. Put in a sprayed 9 x 13 inch pan. Put two rolls side-by-side until cresent rolls are used up. Pour sugar mixture over the cresent rolls and then pour the Mountain Dew around the outside edges of the rolls. Bake for 30 minutes at 350 degrees or until done. Serve warm with ice cream. Take coleslaw, chopped green onions, broccoli flowerettes, and noodles (crush in bag) and put in bowl. Take oil, sugar, vinegar, and chicken flavor packets, mix or wisk in medium bowl until sugar is dissolved. Pour over veggies and mix well. Place in fridge for about 2-4 hours until noodles is soft. Best to make and leave in fridge overnight until you serve next day. That way all the noodles and broccoli will soften. In a large bowl, combine the flour, brown sugar and salt. Cut in butter until crumbly. Set aside 1 cup for topping. Add baking soda to remaining crumb mixture. Stir in water and molasses. Fill paper-lined muffin cups two-thirds full. Sprinkle with reserved crumb mixture. Bake at 350° for 20-25 minutes or until a toothpick comes out clean. Cool for 10 minutes before removing from pans to wire racks to cool. Yield: 2 dozen. Calories: 170 Fat: 3 g Saturated Fat: 2 g Cholesterol: 1 mg Sodium: 289 mg Carbohydrate: 32 g Fiber: 3 g Protein: 4 g Diabetic Exchange: 1 starch, 1 fruit. SERVINGS: 14 CATEGORY: Lower Fat TIME: Prep/Total Time: 20 min. In a large bowl, whisk milk and pudding mix for 2 minutes or until slightly thickened. Place a third of the cake cubes in a trifle bowl or 3-1/2-qt. glass serving bowl. Top with a third of the pudding, 1 cup sliced strawberries, 1-1/2 cups raspberries (OR blueberries) and a third of the whipped topping. 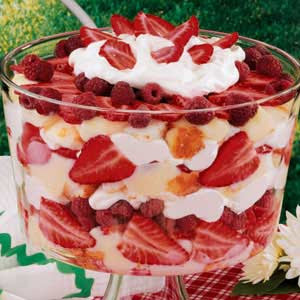 Layer with a third of the cake and pudding, 1 cup strawberries and a third of the whipped topping. Top with remaining cake, pudding, strawberries, raspberries (OR blueberries) and whipped topping. Garnish with quartered strawberries. Serve immediately or cover and chill until serving. Yield: 14 servings. Correctly measuring both dry and liquid ingredients is important for a successful recipe experience. For frosting, combine brown sugar, butter and milk in a saucepan. Bring to a boil over medium heat; cook and stir for 2 minutes or until thickened. Remove from the heat; stir in vanilla. Cool to lukewarm. Gradually beat in confectioners' sugar until frosting reaches spreading consistency. Frost cupcakes. Yield: 1-1/2 to 2 dozen. in another, whisk together the wet ingredients, including the banana. Bake at 400 degrees for 18-20 mins. or until golden. Remove from pans immediately. Set aside four whole berries for garnish ( or peaches ). Slice remaining strawberries ( or peaches ) and set aside. In a large saucepan, combine cornstarch and water until smooth. Bring to a boil; cook and stir for 2 minutes until thickened. Remove from heat; stir in gelatin and sugar until dissolved. Stir in sliced strawberries ( or peaches ) Pour into the crust. Cover and refrigerate for 2 hours or until firm. Cut reserved strawberries in half ( or peaches ). Garnish each serving with whipped topping and a berry half ( or peaches ). Servings: 4 Category: Low Fat Method: Slow Cooker Time: Prep: 10 minutes. Cook: 4 hours 10 minutes. 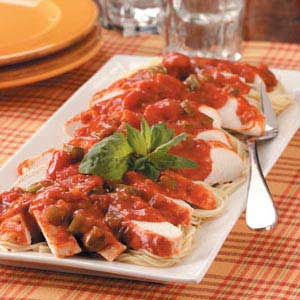 With its nicely seasoned tomato sauce, this enticing chicken entree is especially good over pasta or rice. In a bowl, combine the broth, tomatoes, tomato sauce, green pepper, onion, garlic and seasonings; pour over chicken. Cover and cook on low for 4-5 hours or until a meat thermometer reads 170°. Pour cooking juice into a large saucepan; skim fat. Combine flour and cold water until smooth; stir into juices. Bring to a boil; cook and stir for 2 minutes or until thickened. Serve over chicken and pasta. In a large nonstick skillet, cook the turkey, mushrooms, onion and green pepper until turkey is no longer pink. Add spaghetti sauce and onion salt; bring to a boil. Reduce heat; simmer, uncovered, for 15 minutes. Place cooked noodles in the bottom of a 2-1/2-qt. baking dish coated with cooking spray. Pour meat mixture over noodles. Mix 1/4 cup sugar (or Splenda) with blueberries and peaches; set aside. Whisk together flour, 1/2 cup sugar (or Splenda) and baking powder; set aside. In the microwave, melt butter in an 11x7-inch baking dish. Pour milk into flour mixture and then pour melted butter, leaving about 2 tablespoons butter in the baking dish. Whisk together just until mixed well. Spread blueberries and peaches in the bottom of the baking dish; and then pour batter over top. Sprinkle with sliced almonds. Bake 40 to 45 minutes until nice and golden brown. Serve warm with vanilla ice cream or frozen yogurt. When substituting, you'll use the same amount of Splenda as the recipe calls for sugar. Directions: In a heavy saucepan, melt chips and butter; stir until smooth. Remove from the heat. Stir in sugar and eggs. Combine flour and baking powder; gradually stir into chocolate mixture until smooth. Fill paper-lined muffin cups half full. Bake at 350° for 15-20 minutes or until a toothpick comes out clean (cupcakes will fall in center). Remove from pan to a wire rack to cool. In a large saucepan, cook and stir marshmallows and milk over low heat until smooth. Remove from the heat; stir in extract and food coloring if desired. Cover and refrigerate for about 15 minutes or until cool. Fold in whipped cream. 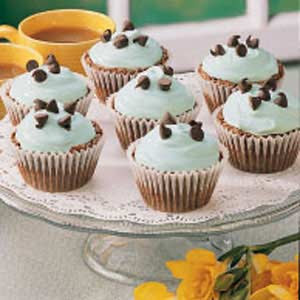 Spread over cupcakes or top each with a dollop of topping. Refrigerate for at least 1 hour. Sprinkle with chocolate chips if desired. Store in the refrigerator. Yield: 16 cupcakes. stir in 1/3 cup melted unsalted butter. Press mixture onto bottom and 1-1/2 inches up sides of a 9-inch springform pan. Bake 8 minutes. Then cool. Beat cream cheese and sugar in large bowl until smooth. Add eggs, sour cream, flour, vanilla and salt; beat until smooth. Stir together 1-1/3 cups batter with melted butterscotch chips* in medium bowl. *To melt chips: place chips in microwave-safe bowl. Microwave at HIGH (100%) for 1 minute; stir. If necessary, microwave at HIGH an additional 15 seconds at a time, stirring after each heating, just until chips are melted when stirred.*. Pour butterscotch mixture into cooled crust. Then in another bowl stir together 1-1/3 cups batter with melted chocolate chips*; pour over butterscotch layer. Stir together remaining batter with melted white chips*; stir until smooth. Bake 55-60 minutes or until center of cheesecake is almost set. Prepare Triple Drizzle - Optional:. Place 1 Tablespoon Hershey's Butterscotch Chips with 1/2 teaspoon shortening only, in a small microwave-safe bowl. Microwave at HIGH (100%) 30-45 seconds; stir. If necessary microwave an additional 15 seconds at a time, stirring after each heating, just until chips are melted when stirred. Repeat procedure with the two other chips. Drizzle Triple Drizzle, one flavor at a time, over top of cheesecake, if desired. Refrigerate until cold, about 3 hours. In a large mixing bowl, combine the flour, sugar, yeast, salt and nutmeg. In a saucepan, heat the milk, water and butter to 120°-130°. Add to dry ingredients; beat until moistened. Beat in eggs until smooth. Cover and refrigerate overnight. In a saucepan, combine the apricots and water. Cook over medium heat for 30 minutes or until the water is absorbed and apricots are tender. Remove from the heat; stir in the brown sugar, juice and nuts. Cool. Roll each into an 18-in. x 12-in. rectangle. Spread half of the filling over each rectangle to within 1/2 in. of edges. Roll up each jelly-roll style, starting with a long side; pinch seam to seal. Place seam side down on greased baking sheets; pinch ends of each together to form a ring. With scissors, cut each from outside edge two-thirds toward center of ring at 1 in. intervals. Separate strips slightly: twist so filling shows, slightly overlapping with previous piece. Cover; let rise in a warm place until doubled, about 1 hour. Bake at 375° for 25-28 minutes or until golden brown. Remove from pans to wire racks to cool. Combine glaze ingredients; drizzle over warm tea rings. Yield: 2 rings (12 slices each). This is a great recipe I found today and tried on my sugar cookies. It dries fast and shiny to a hard finish. I really liked it and there's no problem adding food coloring. Place sugar and milk in bowl. Stir until mixed thoroughly. Add corn syrup and mix well. For filling in areas, use thinned icing (add small amounts or light corn syrup until desired consistency is reached). This recipe is one I found at Jodi's blog, The Deputy Domain. Can't wait to try it! Preheat over to 350oF. Butter a 9x13 pan.Line bottom of pan with 1 roll of crescents. (Pinch seams and press out until entire bottom of pan is covered. )Mix together softened cream cheese, 1/2 c. sugar and vanilla.Beat until creamy. Spread filling over bottom crust.Unroll second tube of crescent rolls and lay over filling.Drizzle melted butter over top crust.Mix cinnamon and sugar. Sprinkle over top crest.Bake at 350oF for 20-25 minutes.Let cool before serving. Spoon rice mixture evenly onto center of each of 4 large sheets of heavy-duty aluminum foil. You may use regular foil however you must be very careful with it. Top each with 1 chicken breast half; sprinkle with chili powder. Drizzle evenly with dressing; top with cheese and veggies.Make packets by bringing the side of foil up and double fold both sides and top; make certain to leave room for the heat to circulate. Bake 25 to 30mins or until chicken is cooked through. Place 1 packet on each of 4 dinner plates. Cut slits in foil with sharp knife to release steam before opening. I particularly enjoy this recipe because I dirty very few dishes in the perpration and your entire meal is in this one dish! LOVE THAT!! Hope you and your family enjoy it as much as mine do. In a large mixing bowl, beat the cake mix, water, eggs and applesauce on low speed for 30 seconds or just until moistened. Beat on medium for 2 minutes or until smooth. 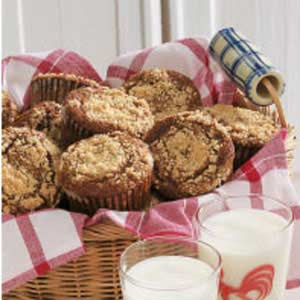 Pour into 24 red paper-lined muffin cups. Bake at 350 degrees for 18 - 20 minutes or until a toothpick comes out clean. Cool for 5 minutes before removing from pans to wire racks. This bread is good for the holidays and to serve with soups, chili or pinto beans. In a non stick large oven proof skillet, fry bacon and chopped onion together until browned, about 5 minutes. Combine dry ingredients and then add milk, buttermilk, melted butter, corn and egg; mix well by hand, don't over mix; pour over bacon-onion mixture and then bake 25 to 30 minutes until golden brown. Turn out onto serving plate and cut into serving size pieces. Serve hot. Mix with 1 teaspoon vanilla extract, 1/2 cup vegetable oil, and 3 eggs. Spread into a greased 9x9 pan and bake at 350º for 30 to 40 minutes or until done. This is great for gifts at anytime! From Gail Blevins, Recipe Exchange! Place pork in dutch oven with olive oil, garlic, salt and pepper. Cover with water and Bake pork on 350 for approximately 3 hours. Take from oven and add red chile. Cook for approximately 20 minutes on med- low until tender. Brown tortillas on both sides, add pork, cheese and sour cream into the middle and fold one side in. Wrap ingredients into center. From Aunt Janice's Recipe Exchange! Heat oven 350 degrees. Spray 13x9-inch baking dish with Pam and then wipe excess with paper towel. Mix together cake mix, pumpkin pie mix, and pumpkin pie seasoning in a large bowl on medium speed about 1 minute, scraping down the bowl to mix ingredients well. Pour into prepared pan and then sprinkle with fresh grated nutmeg. Bake 30 to 35 minutes until well set. Cool completely. Spread topping on cooled cake and then sprinkle with 1 cup chopped sugared pecans. Beat egg white and water. Add pecans and mix until nuts are coated. Mix sugar, salt and cinnamon in a bowl. Add nuts and mix thoroughly. Place in buttered 10x15 jelly roll pan. Bake at 325 degrees oven for 1 hour, stirring every 15 minutes. In a small bowl, combine graham wafers, spices and melted butter. Mix together and press into 8x8" pan lined with tinfoil. Place cream cheese in large mixing bowl and beat with an electric mixer until fluffy. Beat in sugar then egg. Blend dry ingredients together and beat into cream cheese mixture. Beat in pumpkin. Pour mixture into prepared pan and bake at 325 F about 40 min or until filling is just set. Cool on a wire rack for one hour, then refrigerate until serving time. Garnish with whipped cream or topping just before serving. Serve like a pie or in smaller squares. 1. Pour apple cider and cranberry juice in a 30 cup coffeepot. 2. In coffee basket, add sugar, salt, cinnamon sticks and cloves. 4. Serve with a cinnamon stick or apple slice. NOTE: If you do not have a coffeepot, you can put all ingredients in a large pan. Bring to a boil. reduce heat and simmer for 15-20 minutes. I received this from an email recipe exchange. Bake 375 in a loaf pan 8 x 4 about 1 hour, cool in pan 10 min. Stir in 2 Tablespoons chopped and toasted pecans and 2 Tablespoons cocoanut. Spoon over loaf. Melt butter in Dutch oven. Add onion and saute' until tender. Add corn and cook, stirring occasionally, two to three minutes. Stir in pumpkin and next five ingredients. Bring to a boil. Reduce heat and simmer five minutes. Stir in half-and-half and cook until thoroughly heated. Do not boil. Pack in a thermos for a hot meal on the go. Mix first four ingredients together. Make layers of pudding and smashed oreos. Save enough oreos to cover the top of your pudding. Press in a larger dish(13x9)the graham crackers and melted butter and sugar. Then heat the hot fudge topping in the micro-wave and pour over crust. Let cool. Beat milk and pudding together. This will become thick, fold in cool whip and stir in 3/4 of the chopped candy. Pour over the graham cracker mixture. Then sprinkle on the top the remaining chopped candy. You could use any other candy bars that you would rather use. Also you can cut this recipe in half and not make so much. It's great for a large group of people. Courtesy of Mrs. Gail Blevins. Thanks, Mrs. Gail! Day 5; stir in 1 cup flour, 1 cup sugar and 1 cup milk. Days 6 thru 9; stir only. Store the remaining 1 cup starter in a ziploc baggie in the refrigerator until you're ready to make your bread, or begin the 10 day process over again (beginning with step 2). I love being able to give my friends a starter bag. And when I run out of friends, I just start freezing them in the gallon ziploc bags, pulling them out whenever I'm ready to make the bread. Once you make the starter, you don't have to do the ten days to get your loaf. You only need to do the ten days if you plan on giving a starter bag to a friend. They can make their own loaf with it or do their own ten days to give to their friends and so forth. I keep lots of the gallon ziploc bags on hand during the Christmas season when I'm doing my baking. Mostly for this starter. I make this in the small loaf pans at Christmas time to give as gifts. I think one batch makes five or six small loaves. Wrapped in a holiday plastic wrap with a ribbon and recipe attached makes a cute little package!